“Diocletian was of a crafty disposition, with much sagacity, and keen penetration. He was willing to gratify his own disposition to cruelty in such a way as to throw the odium upon others; he was however a very active and able prince. He was the first that introduced into the Roman empire a ceremony suited rather to royal usages than to Roman liberty, giving orders that he should be adored [i.e. greeted with prostration], whereas all emperors before him were only saluted. He put ornaments of precious stones on his dress and shoes, when the imperial distinction had previously been only in the purple robe, the rest of the habit being the same as that of other men. Bede then tells the story of St Alban, Britain's first Christian martyr. There are, though, doubts that Bede's assignment of Alban's martyrdom to the ‘Great Persecution’ of Diocletian is correct. According to, Christian apologist, Lactantius, a contemporary of the events, it was the eastern Caesar, Galerius, who was the prime mover behind the anti-Christian policies, and he spurred Diocletian into action. “Mandates also had gone to Maximian Herculius and Constantius, requiring their concurrence in the execution of the edicts; for in matters even of such mighty importance their opinion was never once asked. Herculius, a person of no merciful temper, yielded ready obedience, and enforced the edicts throughout his dominions of Italy. Constantius, on the other hand, lest he should have seemed to dissent from the injunctions of his superiors, permitted the demolition of churches – mere walls, and capable of being built up again – but he preserved entire that true temple of God, which is the human body. Constantius was the father of Constantine (who is a figure of enormous importance in the history of the Christian Church), so it is reasonable to suppose that Christian sources will have been keen to shine as favourable a light as possible on him. Nevertheless, it does seem that in Constantius' sphere of influence, which included Britain,* there was little persecution. It could be that the story of Alban belongs to an earlier time (see: St Alban: Britain's Protomartyr). Later, just before his death in 339, Eusebius wrote a eulogistic ‘Life of Constantine’. Here, whilst not going so far as to say that Constantius was a Christian, he does allege (Book I Chapter 13) that he “entered into the friendship of the Supreme God” and that (Book I Chapter 27) he “honoured the one Supreme God during his whole life”. In accordance with the principles of the tetrarchy, Galerius replaced Diocletian as Augustus in the East, and Constantius replaced Maximian as Augustus in the West. Lactantius, again, paints Galerius as the villain of the piece: Galerius pressured the decrepit Diocletian (he had been so ill he had almost died in 304) to retire, and he also dictated the choice of the new Caesars – passing over Maximian's son, Maxentius, and Constantius' son, Constantine, in favour of Maximinus Daia (a kinsman of Galerius) and Severus (a crony of Galerius). * Maximinus Daia was Caesar in the East, Severus in the West. 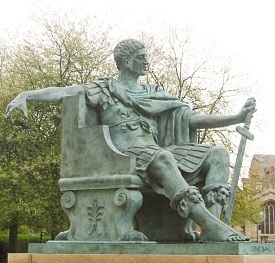 Bronze statue of Constantine, by Philip Jackson, erected beside York Minster (which is built within the boundaries of the Roman fortress) in 1998. “The emperors then in power, observing his [Constantine's] manly and vigorous figure and superior mind, were moved with feelings of jealousy and fear, and thenceforward carefully watched for an opportunity of inflicting some brand of disgrace on his character. But the young man, being aware of their designs, the details of which, through the providence of God, more than once came to him, sought safety in flight; in this respect again keeping up his resemblance to the great prophet Moses. Indeed, in every sense God was his helper; and he had before ordained that he should be present in readiness to succeed his father. Maxentius was in control of Rome. Constantine prepared to oust him. The decisive engagement, at the Milvian Bridge (which crosses the Tiber to the north of Rome) on 28th October 312, ended in a victory for Constantine, and the death of Maxentius. Constantine is said to have triumphed under the banner of Christ. The next day, Constantine obeyed the command. 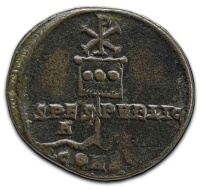 A bronze coin of Constantine, depicting a ‘labarum’ – as a standard bearing the Chi-Rho is called – spearing a serpent. the cross-bar of the spear was suspended a cloth, a royal piece, covered with a profuse embroidery of most brilliant precious stones; and which, being also richly interlaced with gold, presented an indescribable degree of beauty to the beholder. This banner was of a square form, and the upright staff, whose lower section was of great length, bore a golden half-length portrait of the pious emperor and his children on its upper part, beneath the trophy of the cross, and immediately above the embroidered banner. Constantine commemorated his victory with a triumphal arch in Rome. It is decorated with scenes from the campaign, but there are no Christian symbols to be seen. Whatever the truth of the matter, there is no doubting Constantine's commitment to the Christian Church after 312. Perturbed by this chain of events, Maximinus Daia mounted a campaign against Licinius. Following the defeat of his army, near Heraclea, in Thrace, on 30th April, Maximinus fled, and subsequently committed suicide at Tarsus, probably in July 313. * And then there were two. First attested in an inscription, from Africa, of 315 is Constantine's adoption of the title Britannicus Maximus, which indicates that he had a military success in Britain. This marble head from York is quite possibly the earliest portrait of Constantine. On the face of it, Book I Chapter 25 seems to imply that Constantine returned to Britain very soon (i.e. in 307) after his accession (306) – conceivably, it could be a garbled reference to the campaign Constantine had fought with his father, against the Picts, immediately before. However, Eusebius next launches into his account of Constantine's Italian campaign against Maxentius (312). Perhaps, therefore, he is referring to the trip to Britain, that it is proposed was made by Constantine just prior to that expedition. “Constantine, being a man of great energy, bent upon effecting whatever he had settled in his mind, and aspiring to the sovereignty of the whole world, proceeded to make war on Licinius ... And first of all he overthrew him, by a sudden attack, at Cibalæ in Pannonia [now Vinkovci in eastern Croatia], where he [Licinius] was making vast preparations for war; and after becoming master of Dardania, Moesia and Macedonia, took possession also of several other provinces. 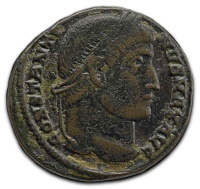 With the surrender and abdication of Licinius, in 324, Constantine become emperor of the whole Roman Empire. 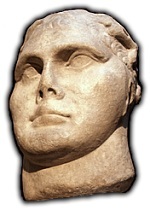 In response to a plea for clemency by Constantia, Constantine allowed Licinius to live as an ordinary citizen in Thessalonica. He soon thought better of it, however, and had him put to death. Constantine had already, in 317, raised two sons – Crispus, his only son by his first wife (or mistress), Minervina; and Constantine, at the time just a baby, by his second wife, Fausta – to the rank of Caesar. He now raised his third son, seven-year-old Constantius, to the same rank. In practice, Crispus – who had commanded Constantine's navy in the final war against Licinius – ruled in the West, whilst Constantine ruled in the East. Constantine started rebuilding and enlarging the ancient Greek town of Byzantium, which he named Constantinople (modern Istanbul) after himself. In 333 Constantine raised his fourth son, Constans, to the rank of Caesar. In 335 he raised Dalmatius, the son of his half-brother, to the same rank. Dalmatius' brother, Hannibalianus, was designated “King of Kings and ruler of the Pontic tribes”*. Constantine died, in a villa on the outskirts of Nicomedia, on 22nd May 337. His body was returned to Constantinople for burial. “... Constantine, who alone of all that ever wielded the Roman power was the friend of God the Sovereign of all, has appeared to all mankind so clear an example of a godly life. Indeed, in 296 Constantius had overthrown a usurper, and returned the British provinces to Rome after a decade of separation. See: New Empires. Rome was the symbolic capital of the Empire, but it was no longer home to an emperor. The tetrarchs moved between more strategically sited centres. Notable imperial centres were Trier, for Constantius; Milan, for Maximian; Thessalonica, for Galerius; and Nicomedia, for Diocletian. In the fullness of time (before the end of the 4th century), the tetrarchs' informal geographical division of responsibility would crystalize into four formal administrative regions of the Empire. From west to east: the Prefecture of the Gauls (which included Britain), the Prefecture of Italy, the Prefecture of Illyricum, and the Prefecture of Oriens (the East). The ‘Origo Constantini Imperatoris’ (The Lineage of the Emperor Constantine) was, it seems likely, originally composed soon after Constantine's death in 337, and is generally regarded as providing a sober, trustworthy, view of its subject matter. It is the first of two works which form the ‘Anonymous Valesianus’ (the second work being mainly concerned with Theodoric 'the Great', king of the Ostrogoths – dating from about 527), which coexist in a single ninth century manuscript – as might be guessed, both are by unknown authors. They were first published in 1636 (in Paris) by Henri de Valois (in Latin: Henricus Valesius), from whom they are named. A grouping of Germanic tribes along the upper Rhine. “... overcome by calamities, he [Galerius] was obliged to acknowledge God, and he cried aloud, in the intervals of raging pain, that he would re-edify the Church which he had demolished, and make atonement for his misdeeds ...”. Accordingly, Galerius issued an edict ending Christian persecution on 30th April 311. Galerius made Licinius, his friend of long standing, Augustus in November 308. According to legend, Helena discovered the True Cross. It is not clear, however, that she was formally married to Constantius. (Whether she was or she wasn't, Constantius discarded her to marry a daughter of Maximian.) Zosimus was fiercely pagan and hostile towards Constantine. Later (Book II Chapter 9) he calls Constantine “the son of a harlot”. The Latin phraseology Lactantius uses (Chapter 44) to describe the symbol Constantine used is not at all clear, literally translating into English as “the letter Chi traversed, with the highest top bent round, he marked Christ on the shields”. Opinion seems to be split between those scholars who interpret this description as a Chi-Rho symbol (also known as a Christogram), and those who see it as a Crossogram or Staurogram (illustrated right). These killings are ignored by Eusebius, whilst Zosimus, the hostile pagan, says (Book II Chapter 29) that Constantine only espoused Christianity in order to obtain absolution for them (plainly not true – Constantine had been devoted to Christianity for the previous fourteen years). There is also an Adventus coin, from the London mint, which has been dated to 307. However, as noted by Anthony R. Birley (‘The Roman Government of Britain’, 2005), “it is a single specimen of dubious authenticity”. A dispute had arisen due to the teachings of Arius (Arianism). Arianism suggests that Jesus Christ is not the equal of God. The Council, however, decided that Jesus Christ and God are of one substance – their statement of which is known as the ‘Nicene Creed’. The Council also settled differences concerning the date of Easter – they agreed that it should be celebrated on the first Sunday after the first full moon of the spring equinox. ‘Anonymous Valesianus’ (‘Origo Constantini Imperatoris’) Chapter 35. There is conflicting evidence for the date of Diocletian's death. In his paper ‘Lactantius and Constantine’ (‘The Journal of Roman Studies’, Vol. 63, 1973) T. D. Barnes makes a persuasive case for 3rd December 311. According to Lactantius (‘De Mortibus Persecutorum’ Chapter 49), Maximinus suffered a slow, excruciatingly painful, death after taking poison.